People are living in homes where roofs, windows, even walls are missing, using blue tarps to keep the elements at bay. A crew working with FEMA's Emergency Home Repair program. It wasn't until March, six months after the hurricanes hit, that FEMA launched this program on St Thomas. Hophni and his wife, Dorset, have lived there more than 25 years, but never experienced anything like last year. The Virgin Islands were hit by back-to-back Category 5 hurricanes in September: Irma and then, two weeks later, Maria. The storms blew out windows and ripped off part of their roof. Wind and rain ruined most of their possessions. More than eight months later, they're still cleaning up. "There was a big cabinet there and everything fall down," Hophni says. "And the worst of it — walking in the water [and] the amount of glass." A crew working with FEMA's Emergency Home Repair program has already replaced the glass in many of the Martins' windows. Workers are now replacing the galvanized metal on his roof. In the months after the hurricanes, FEMA found that temporary housing programs that were effective in Florida and Texas made little sense in the Virgin Islands. Mobile homes were impractical and the few hotels that reopened weren't available for housing because they were filled with relief crews. It wasn't until March, six months after the hurricanes hit, that FEMA launched this program on the island. "What we're trying to do is we want to give them a functioning kitchen, a place to sleep and a functioning bathroom," says Brent Hazzard, who supervises some of the work crews. Nearly nine months after the hurricanes, in the Virgin Islands recovery is going slower than many expected. Fewer than 100,000 people live on the three major islands — St. Croix, St. John and St. Thomas. But, as hurricane season begins, most in the Virgin Islands say they're not ready. One of them is Bruce Perry. For him and his wife Wilma, the emergency repair program provided some of the first good news they've had since the storm. They're able to use only three of their seven rooms because water from an upstairs neighbor's patio leaks into their home every time it rains. He's hopeful a FEMA crew will soon have his home sealed and weatherproof. "I'm probably more fortunate than most," he says. "But all you got to do is drive around, count the blue roofs that are not ready for another hurricane." Blue tarps covering damaged roofs are still visible all over the Virgin Islands. "People are stressed and they're scared because yes, we are coming on to the next hurricane season," says Daryl Griffith, who heads the Virgin Islands Housing Finance Authority. "More than three-quarters of our population received some type of hurricane damage. That means that we're actually in a precarious state when it comes to housing right now." Even in the best of times, affordable housing is a scarce commodity. Construction costs are much higher here than on the mainland. Because of that, Griffith says the FEMA funded repairs, capped at $25,000, don't cover even the full cost of replacing a roof. "It's about $40,000 to replace an average size roof," he says. 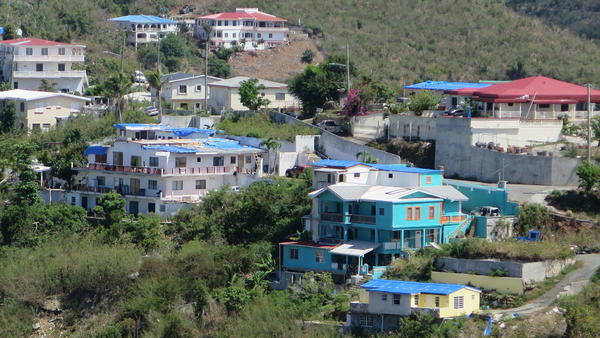 "And if you've seen the terrain in St. Thomas, a lot of our homes are on hills. So, not only do you have to ship it in, then you have to go on a hill and you have to get a crane and all that stuff while it's on a sloped embankment. So that adds to the cost." Construction costs are even higher on St. John, a small, beautiful island accessible from St. Thomas by ferry. On the eastern end of St. John, residents in the community of Coral Bay have struggled since the storm for basic necessities like power and phone service. Myrtle Isaac is a caseworker with a local foundation and her husband is the pastor of Emmaus Moravian Church in Coral Bay. "That is where we were living," she says, pointing to a large three-story stone building, the church's Fellowship Hall. During the storm, the roof of that building and the church were blown away and still haven't been replaced. FEMA is working with the church on a plan to repair the buildings, and Isaac and her husband found temporary quarters nearby. But many of their church members aren't as fortunate. "Some are living in tents," she says. "Some still, they have the cover, the tarps, you know. They don't want to go to a shelter." On St. John and St. Thomas, people are living in homes where roofs, windows, even walls are missing, using blue tarps to keep the elements at bay. For many, Isaac says, the FEMA repair program is no help at all. "You have to have walls, four walls up in order for them to repair your place," she says. A survey of homeowners in Coral Bay found that, as hurricane season begins, one-fifth of them don't have a safe place to stay. More than one-quarter also report they don't have phone service or any way to call 911 in case of an emergency. For those eager for a quick recovery, Virgin Islands Gov. Ken Mapp has a message: be patient. "We're eight or nine months out," he says. "Recovery is five to seven years." Mapp says the long-term picture is brighter. The large infusion of federal funds to help rebuild the islands' infrastructure, he says, is a once-in-a-lifetime opportunity. A project to rebuild and harden the territory's power grid is already underway. By the fall, modular buildings to replace damaged schools are expected to be ready so classes can resume on schedule. There's also money to repair and replace damaged hospitals, roads and government buildings. "We qualify for a little over $8 billion in all categories," he says. "It is a lot of money. The Virgin Islands has not had that experience in any of its previous four storms, and that type of resources. But that lends itself to our federal partners recognizing how broken the system is." Federal money also will be available to replace at least 3,000 homes here were destroyed in the storms, but not until the end of the current hurricane season. We've been here this past week asking whether the island is prepared for hurricane season. We want to be clear - it is not the only place that was affected by last year's hurricanes. The U.S. Virgin Islands are just east of Puerto Rico. They took direct hits from both Hurricanes Irma and Maria, which were both Category 5 storms when they hit the Virgin Islands. There was massive destruction. 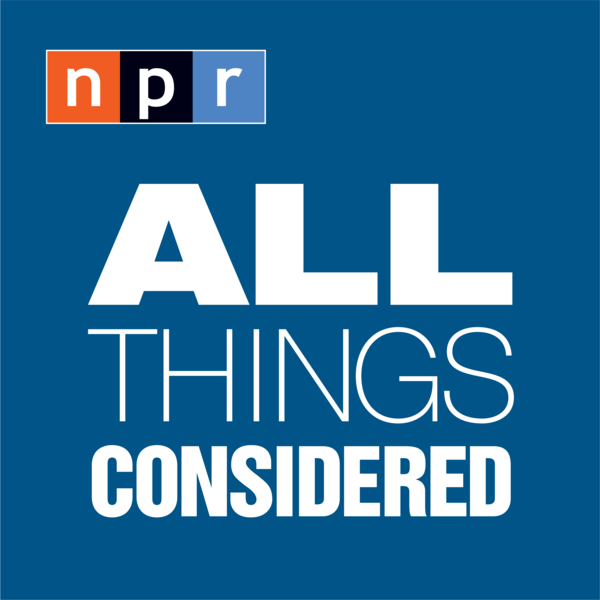 NPR's Greg Allen just spent time on the Virgin Islands, and he's with us now to tell us about the conditions there and how the recovery is going. Greg, thanks so much for joining us. GREG ALLEN, BYLINE: Sure, Michel. MARTIN: So like Puerto Rico, the Virgin Islands are U.S. territories. The residents are U.S. citizens. How do people feel about the help that they've received from FEMA and other entities within the federal government? ALLEN: Well, you know, many people I've talked to there say that they're actually pretty pleased by the response and the attention they've gotten from the federal government. Now just to orient everyone, you know, there are three main islands in the U.S. Virgin Islands - St. Thomas, St. John, and St. Croix - and all of them took major damage. But compared with Puerto Rico, you know, the U.S. Virgin Islands is very small. Fewer than 100,000 people live on the islands there. That's versus 3.4 million, as you know, in Puerto Rico. But because it's so small and isolated so far from the mainland, people there have to be self-reliant. They have been, even after the hurricane. When help arrived, it was also much easier to reach those who needed it than in Puerto Rico, where, you know, you have to go miles inland to get up in these mountain communities. So it was very difficult there in the first weeks and months with no power, no communications, limited water and other supplies. But since then, things have gotten better. And I think many people are pleased at the vigorous federal response. MARTIN: You know, the Virgin Islands are dependent on tourism even more than Puerto Rico. Are visitors starting to come back? ALLEN: Well, yes, tourism is the economy in the Virgin Islands. Some visitors are back. It's an important cruise line destination, and cruise ships have been docking there just since a few months after the storms. Small hotels, timeshares and Airbnbs are back open, but the big resorts remain closed and probably will until next year at least. So that's left many there without jobs, and it's put a big hole in the island's economy. MARTIN: How are people feeling there with the beginning of this next hurricane season? ALLEN: Well, the Virgin Islands is no - they're no strangers to hurricanes there, of course, but last year was really tough with those, you know, two big hurricanes, as you mentioned. Irma had winds over 180 miles per hour when it hit St. Thomas. It tore off roofs and blew out windows. Then two weeks later, they had another Category 5 storm in Maria with more wind and rain. So as hurricane season begins this year, many people I talked to said - in the Virgin Islands - they say they're just not ready. I was in St. Thomas recently, and there I visited a community that saw a lot of damage. It's called Anna's Retreat. Up at the top of a very steep road, there's a house owned by a friendly man whom I met. His name is Hophni Martin. HOPHNI MARTIN: H-O-P-H-N-I. You'll find it in First Samuel, yeah. I'm not a Bible man, but my father was. He gave us the name (laughter). ALLEN: Hophni and his wife, Dorset Martin, have lived here more than 25 years but never experienced anything like last year. The Virgin Islands was hit by back-to-back Category 5 hurricanes, Irma, and then two weeks later, Maria. The storms blew out windows and ripped off part of their roof. Wind and rain destroyed most of their possessions. More than eight months later, they're still cleaning up. ALLEN: A crew working with FEMA's Emergency Home Repair Program has already replaced the glass in many of Martin's windows. Workers are now replacing the galvanized metal on his roof. It wasn't until March, six months after the hurricanes hit, that FEMA launched this program on the island. Brent Hazzard supervises the work crews. BRENT HAZZARD: What we're trying to do is we want to give them a functioning kitchen, a place to sleep and a functioning bathroom. 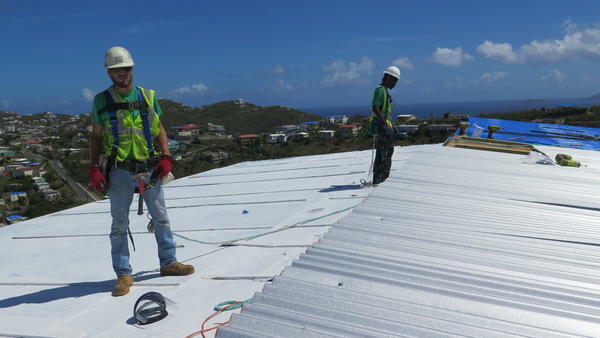 ALLEN: Blue tarps covering damaged roofs are still visible all over the Virgin Islands and a clear sign the islands aren't ready for hurricane season. DARYL GRIFFITH: People are stressed, and they're scared because, yes, we're coming onto the next hurricane season. ALLEN: Daryl Griffith heads the Virgin Islands Housing Finance Authority. GRIFFITH: More than three-quarters of our population receives some type of hurricane damage. That means that we're actually in a precarious state when it comes to housing right now. ALLEN: Even in the best of times, affordable housing is a scarce commodity. Construction costs are much higher here than on the mainland. Because of that, Griffith says, the FEMA-funded repairs, capped at $25,000, don't cover even the full cost of replacing a roof. GRIFFITH: It's about $40,000 to replace a average-sized roof. And if you've seen the terrain on St. Thomas, a lot of our homes are on hills. So not only do you have to ship it in and then you have to go on a hill, and you have to get a crane and all that stuff while it's on a slope embankment. So that adds to the cost. ALLEN: Construction costs are even higher on St. John, a small, beautiful island accessible from St. Thomas by ferry. On the eastern end of St. John, residents in the community of Coral Bay have struggled since the storm for basic necessities like power and phone service. Myrtle Isaac is a caseworker with a local foundation. Her husband is the pastor of Emmaus Moravian Church in Coral Bay. MYRTLE ISAAC: That building up that way to my right, that is where we were living. ALLEN: She's pointing to a large three-story stone building, the Fellowship Hall. During the storm, the roofs of that building and the church were blown away and still haven't been replaced. Isaac and her husband found temporary quarters nearby, but many of their church members aren't as fortunate. ISAAC: ...You know, they don't want to go to a shelter. ALLEN: On St. John and St. Thomas, people are living in homes where roofs, windows, even walls are missing, using blue tarps to keep the elements at bay. For many, Isaac says, the FEMA repair program is no help at all. ISAAC: You have to have walls, four walls up for them to repair your place. ALLEN: So people who actually have a wall missing, they won't - 'cause $25,000 doesn't go very far. ISAAC: No. No. They just do manual repairs. ALLEN: A survey of homeowners in Coral Bay found that as hurricane season begins, a fifth don't have a safe place to stay. For those eager for a quick recovery, Virgin Islands Governor Ken Mapp has a message - be patient. KENNETH MAPP: We're eight or nine months out. Recovery is five to seven years. ALLEN: Long term, Mapp says, the picture is brighter. The large infusion of federal funds to help rebuild the island's infrastructure, he says, is a once-in-a-lifetime opportunity. MAPP: We qualified for a little over 8 billion in all categories. It is a lot of money. The Virgin Islands has not had that experience in any of its previous four storms in that type of resources. But that lends itself to our federal partners recognizing how broken the system is. ALLEN: A project to rebuild and harden the territory's power grid is already underway. By the fall, modular buildings to replace damaged schools are expected to be ready so classes can resume on schedule. There is also money to repair and replace damaged hospitals, roads and government buildings. Federal money also will be available to replace at least 3,000 homes here that were destroyed in the storms, but not for months, not till the end of the current hurricane season. MARTIN: Greg Allen, thank you so much. ALLEN: My pleasure. Transcript provided by NPR, Copyright NPR.